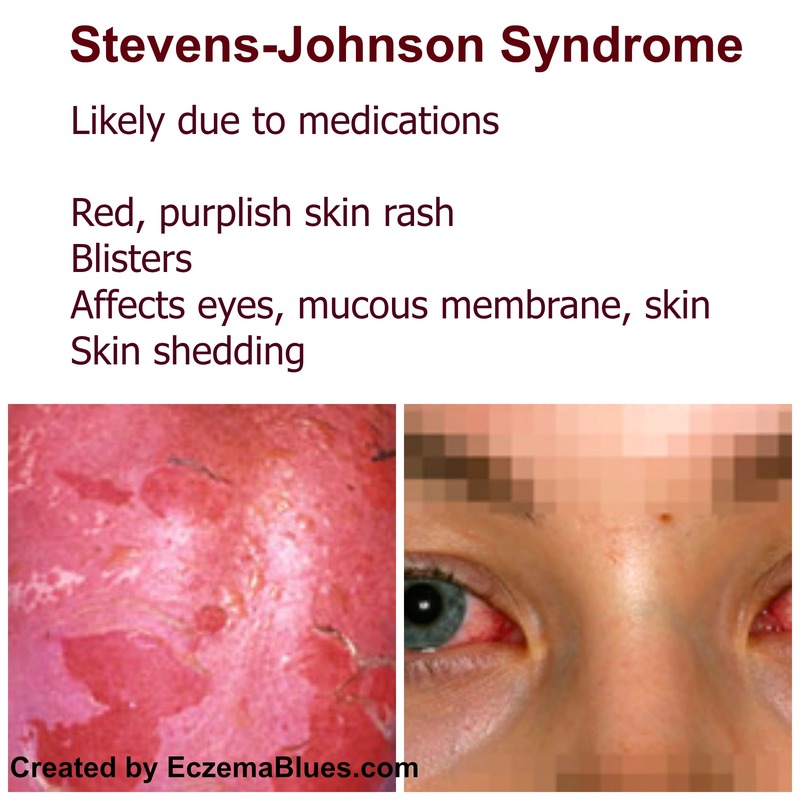 Stevens-Johnson Syndrome (SJS) is a rare, severe disorder that causes pain, red/purplish skin, blisters and shedding of skin. It can be drug-induced or due to infection. It is a medical emergency and takes from weeks to months to recover. It is more common in adults or older people and men who use more of the possible drugs that trigger the SJS. Its cause is largely drug-induced (more than 70%) or due to infection. However, genetics, family history and weakened immune system are also risk factors. In children, Epstein-Barr virus, enteroviruses and upper respiratory tract infection. Diagnosis is usually made via physical examination or skin biopsy. Finding out the cause, in particular for drug-induced cases, is critical. Discontinue the drug. Treatment is to reduce pain, control itch, prevent dehydration, infection and inflammation. Oral corticosteroids and antibiotics may be prescribed. The patient is usually hospitalized. Similar to Pemphigus Vulgaris, mouth/blister care is required. Care of the skin includes application of lotions and wet dressings (wound care, wet compress). Particular to Stevens-Johnson Syndrome, eye care is also important to clean and prevent dry eyes. Complications include sepsis (blood infection), secondary skin infection (cellulitis), eye inflammation (tearing and scaring of cornea and even blindness) and permanent skin discoloration and damage (including nails). Anyone have had SJS? Do share in the comments, thanks loads for spreading encouragement and experience.